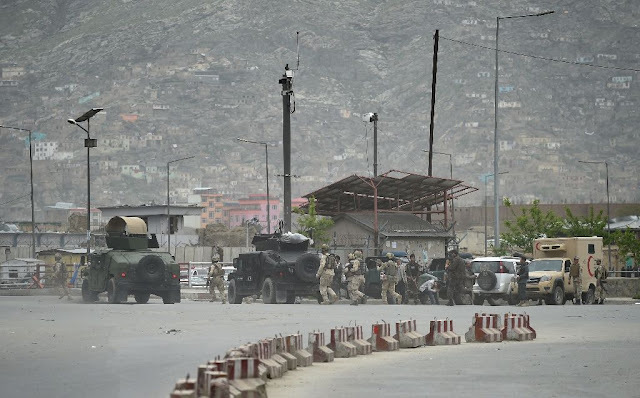 Kabul (AFP) - A powerful Taliban car bomb followed by a fierce firefight left many people dead or wounded in Kabul Tuesday, the Afghan president said, a week after the insurgents launched their annual spring offensive. The Taliban claimed responsibility for the attack near government offices, which sent clouds of acrid smoke billowing in the sky and rattled windows several kilometres (miles) away. The brazen assault in a densely packed neighbourhood marks the first major Taliban attack in the Afghan capital since the insurgents announced the start of this year's fighting season. "(We) condemn in the strongest terms the terrorist attack in Puli Mahmood Khan neighbourhood of Kabul, as a result of which many of our countrymen were martyred and wounded," Ghani said in a statement without specifying the number. The Afghan health ministry said at least 208 wounded people were rushed to hospital but did not specify any fatalities. "Such cowardly terrorist attacks will not weaken the will and determination of Afghan security forces to fight against terrorism," Ghani said. "The first blast was carried out by a suicide bomber in a car and possibly one or two bombers are still resisting," interior ministry spokesman Sediq Sediqqi told AFP. "The scene of the attack has been completely cordoned off by Afghan security forces." The Taliban on Tuesday last week announced the start of their "spring offensive" even as the government in Kabul seeks to bring them back to the negotiating table to end the drawn-out conflict. The Taliban warned they would "employ large-scale attacks on enemy positions across the country" during the offensive dubbed Operation Omari in honour of the movement's late founder Mullah Omar, whose death was announced last year. The insurgents began the fighting season last week by targeting the northern city of Kunduz, which they briefly captured last year in a stunning setback for Afghan forces. But officials said Afghan security forces drove Taliban fighters back from the city on Friday. The annual spring offensive normally marks the start of the "fighting season", though this past winter the lull was shorter and rebels continued to battle government forces, albeit with less intensity. The Taliban's resurgence has raised serious questions about Afghan forces' capacity to hold their own. An estimated 5,500 troops were killed last year, the worst-ever toll. Peace talks which began last summer were abruptly halted after it was revealed that Taliban leader Mullah Omar had been dead for two years, a disclosure which sparked infighting in the insurgents' ranks. 0 Response to "Heavy casualties as Taliban suicide bombing, gunfire rattle Kabul"